Dimitri Vegas & Like Mike returned to Belgium last weekend for three sold-out shows (17, 18, and 19 December), with special guests Afrojack, Armin van Buuren and Ne-Yo, plus an exclusive vinyl-only session. After last year’s ‘Bringing The World The Madness’, fans welcomed the announcement of ‘Bringing The Madness 3.0’ by apparently snapping up 40,000 tickets in under 40 minutes—a feat only previously managed by names such as U2, Madonna, Beyoncé and Coldplay. The duo performed a ‘back to their roots’ all-vinyl as part of the full show – showcasing not only some of their best loved tracks, but also their history behind the decks in the electronic scan that spans more than 10 years. Dimitri Vegas & Like Mike’s upcoming album will be hot off the heels of their Ne-Yo collaboration ‘Higher Place,’ which was apparenty the most Shazamed track of Tomorrowland, TomorrowWorld, and Creamfields, with 13 million Spotify streams and more than 8 million YouTube views. ‘Higher Place’ marks the first single to be released under the duo’s relationship with Motown Records and Ne-Yo’s Compound Entertainment. In the course of their career so far, Dimitri Vegas & Like Mike have scored 10 No. 1 Beatport hits and multiple iTunes number ones. They earned the title of ‘Main Stage Residents’ at Tomorrowland festival in Belgium, USA (TomorrowWorld), and Brazil. 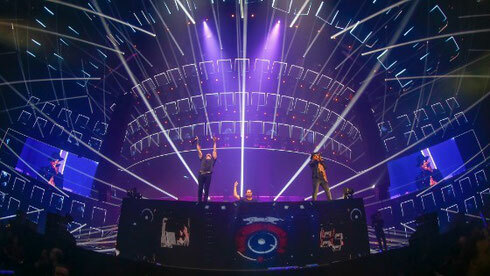 They’ve hosted residencies at both Hakkasan in Las Vegas and Amnesia in Ibiza. Meanwhile, the video for their 2015 track ‘The Hum’ [vs. Ummet Ozcan] starred Charlie Sheen and Jean-Claude Van Damme and is closing in on 30 million views. The duo will now head to the U.S. first quarter of next year to finish their new album.